After a better second episode, American Gods takes a step back in "Muninn". Odd character choices and dialogue along with some serious pacing issues don't do this episode any favors. The premiere episode of season 2 is an odd combination of good and bad writing. The producers, show runner and director all seem to be working hard to evoke the look and feel of what Bryan Fuller and Michael Green managed to do in the first season, but it feels like it doesn't have a soul. It's not quite there. Hopefully the show finds it's footing and gets better as the season progresses. Season 2 Premiere Date Revealed! December 14, 2018	FreakingGeeksMedia	The American Gods Podcast	Comments Off on Season 2 Premiere Date Revealed! 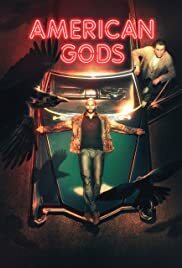 October 5, 2018	FreakingGeeksMedia	The American Gods Podcast	Comments Off on Season 2 Teaser Trailer Released! Sam Black Crow Has Been Cast! June 7, 2018	FreakingGeeksMedia	The American Gods Podcast	Comments Off on Sam Black Crow Has Been Cast! April 2, 2017	FreakingGeeksMedia	The American Gods Podcast	Comments Off on OMG! March 3, 2017	FreakingGeeksMedia	The American Gods Podcast	Comments Off on Premiere Date Confirmed! It Starts In April . . . No Joke! January 11, 2017	FreakingGeeksMedia	The American Gods Podcast	Comments Off on It Starts In April . . . No Joke! Are Those Claw Marks On Your Back? October 26, 2016	FreakingGeeksMedia	The American Gods Podcast	Comments Off on Are Those Claw Marks On Your Back? Did You Know That George McFly Was A Hellion? October 8, 2016	FreakingGeeksMedia	The American Gods Podcast	Comments Off on Did You Know That George McFly Was A Hellion? How do you even say Polunochnaya!? September 23, 2016	FreakingGeeksMedia	The American Gods Podcast	Comments Off on How do you even say Polunochnaya!? September 10, 2016	FreakingGeeksMedia	The American Gods Podcast	Comments Off on Babe, You’re Dead. Who Said I Died, Puppy? August 3, 2016	FreakingGeeksMedia	The American Gods Podcast	Comments Off on Who Said I Died, Puppy?